Connect Groups are small groups of people that meet regularly at home or other places in an informal environment. We have many different types of connect groups: Some are geographically based, some are language based. There are also connect groups for young professionals, young families, etc. The word C.O.N.N.E.C.T. stands for Community Of Nations Networking, Equipping a Core of Three. God has designed us to live in community. We need God and we need one another. In the book of Hebrews, we are told to “not give up meeting together, as some are in the habit of doing” but to continue meeting so that we can encourage and “spur one another on towards love and good deeds.” Connect group is the place where we can experience genuine friendship, unselfish loving, practical serving and all the “one another” commands in the Bible. Community of Nations speaks of our multicultural vision. We desire to see many nations being incorporated into our community. The connect group is not just a social group. We must continue to network by building relational bridges with those who do not know Christ. We share the Good News of Jesus Christ as we know He is the answer to the world. Our dream is to turn multitudes into ministers. We are created to be contributors. God has given each believer a special gift. It is our responsibility to discover and exercise those gifts to bless others. At the mean times, by fulfilling those roles that God designed for you, you will discover great joy and satisfaction. Connect group is a good place to be equipped in the word of God as well as in character and competence for the ministry that God has for you. 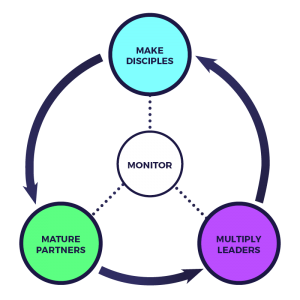 In a connect group, it is difficult to disciple the members one on one. The core of three is a buddy system where two or three (maximum) can form a little group to provide accountability and support to each other in an informal and casual, yet intentional, setting. It will also facilitate the development of closer friendships in a smaller group setting. The core of three should be formed among members of the same gender and accountability relationships should be formed within the parameter of the same connect group. What happens in a CONNECT meeting? CONNECT groups will usually open with a time of praise & worship (10 mins) followed by a time of sharing and Biblical discussion based on topics related from sunday sermons. The meeting will usually conclude with a time of prayer and fellowship, where we enjoy a variety of different kinds of food. Strong bonds are built so that when we go through tough times there is someone to love support and encourage us. CONNECT groups are also fun – we regularly dine out, enjoy barbeques, go on bushwalks and make trips to the beach. It’s easy for us to bring our unchurched friends so we’re always meeting new people from all over the world and all walks of life. Please contact Pastor Faith Leong to find a CONNECT group. We encourage you to join one this week! We have many connect groups at different locations. There are a diversity of connect groups ranging from language based (bi-lingual), students & youth, young adults, married couples, families, seniors & working holiday people. 1. Experience Christ’s joy and victory more fully in every area of your life. 2. Deepen friendships with other cell members and Christians. 3. Discover how to be free from fear and resentments. 4. Learn how to minister Christ’s victory to others. Eventually every member both young and old in our church will be encouraged to attend. You should have completed MD101 course & the Pre-Encounter Camp class. If in doubt see your Connect Group leader or Ps Faith Leong. We strongly encourage all connect pastors and assistants to attend and accompany your connect group members. Confess James 5:16; Assure forgiveness; Break bondages; Cast Away; Destroy images and Extend God’s healing. The next ENCOUNTER CAMP will be held in 2019 – watch this space for more information closer to the date.